Even with little to show, Obama still hasn't given up engaging America's foes. In Syria, it might just work. 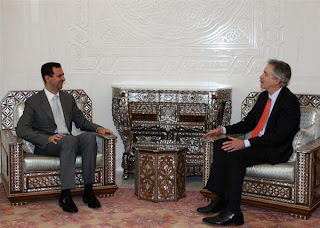 As the White House was naming the new ambassador in Washington, Under Secretary of State William Burns was meeting President Bashar al-Assad in Damascus. This week, President Obama named Robert S. Ford as his ambassador to Syria—meaning that he still intends to engage America's foes. (Ford would be the first U.S. ambassador there since the 2005 assassination of Lebanese prime minister Rafik Hariri.) And while the president's record so far against Venezuela, North Korea, and Iran might merit a reconsideration of the "engagement agenda," this time it might be different, because Syria is in a bind. The regime is running record budget deficits, and it is suddenly fanatical about ending U.S. sanctions (which, Damascus has only just admitted for the first time, are truly damaging). Once upon a time, Syria was obsessed by political problems—Lebanon, President Bush, the Golan Heights. Today, the game is more about economics than ever before (including the last time we tried serious engagement with Syria). Which means President Bashar al-Assad may finally be ready to play ball. The backstory, of course, is sanctions—and how badly they've hit the Assad regime even if they haven't changed its behavior yet. They began in 1979, when the United States added Syria to the list of state sponsors of terrorism for supporting Palestinian terrorist groups, but the screws really tightened after 2003, when Syria allowed jihadist insurgents fighting the U.S. occupation to cross into Iraq. The resulting Syrian Accountability and Lebanese Sovereignty Restoration Act (SALSA), alongside a series of executive orders, banned all U.S. exports except food and medicine, seized the assets of regime officials, and banned U.S. dollar transactions with the state-owned Commercial Bank of Syria. With enforcement overseen by the no-nonsense Commerce Department, it became even harder to trade with Syria than with Iran. To protect their pride, officials from Damascus had to pretend the sanctions didn't hurt them very much. But the evidence is everywhere. First Syria had to switch from deals in dollars to those in euros to avoid restrictions on dollar-denominated oil sales. Then the regime had to ground most of its civilian air fleet—as well as President Assad's personal jets—because the sanctions forbid the sale of spare parts without an export license. (Sanctions classified anything with more than 10 percent American content as an American product, and since U.S. companies dominate the aerospace industry, even third-party retailers from other parts of the world couldn't sell the parts to Syria.) Worse still, Damascus was compelled to institute rolling electricity blackouts because U.S. sanctions made it very difficult for international companies to build new power stations there. Executive orders by President Bush even held up the sale of a number of lucrative companies owned by Assad's cousin. The regime's economic woes only made sanctions more effective. Syria's Central Bureau of Statistics (CBS), which supplies official figures used by the International Monetary Fund, claims that the economy grew at 4 percent in 2009. But other data make those numbers appear to be exaggerated: in the past five years, oil production—traditionally the regime's lifeline—has plunged 30 percent, making Syria a net importer and causing Damascus to run record budget deficits upward of 10 percent of GDP. (Deficits are new in Damascus; when Assad's father was president, budgets were always balanced.) Then a massive three-year drought devastated Syrian agriculture, displacing up to 300,000 residents in Syria's northeast. Meanwhile, free-trade agreements between Syria and Turkey undermined Syria's heavily protected market, slamming Syria's manufacturing sector, which contracted some 14 percent in the past two years. Exacerbating these pressures, children born during a baby boom in the 1980s and early 1990s are finally entering the labor market, meaning that the Assad regime has to create more jobs than ever just to keep the official unemployment rate steady at 11 percent. Damascus has never needed a bailout as badly as it does now. That's why Washington is looking for creative ways to turn sticks (sanctions) into carrots (cash). Syria clearly wants the Obama team to dump trade sanctions, banking restrictions, and a spate of executive orders from the Bush years that make life difficult for the regime. For its part, Washington has already eased export-license restrictions on aircraft repairs for the state-owned Syrian Arab Airways. It is also considering more scholarships (for Syrians to study in the United States), cultural and business exchanges, lifting its block of Syria's WTO application, and repairs to more Syrian aircraft—in return for incremental changes in Assad's behavior. It's true that we've been down this road before, which is why there are plenty of doubters in Washington—those who think that, even if we bankrolled Syria's entire government, it wouldn't change Assad's behavior. After the October 1973 War, the United States extended $534 million in assistance to Damascus, hoping to lure it from the Soviet orbit and into a peace treaty with Israel. Instead, Syria became a leading critic of the 1979 Camp David accords (between Israel and Egypt), earned the label of state-sponsor of terrorism, and was cut off from U.S. assistance. When Washington reengaged Damascus in the 1990s, American diplomats circumvented the ban on foreign aid by enticing U.S. companies to invest in Syria's energy sector, including a $430 million gas deal with ConocoPhillips. The down payment came to nothing when Assad's father, Hafez, turned down President Clinton's March 2000 Syria-Israel peace treaty in Geneva. That's why President Obama may be tempted to ease Syria's pain—by rewriting the executive orders girding the sanctions regime due to be renewed next May—with some expectation that he'll get something in return. He shouldn't. Since Syria won't abandon support for terrorist groups tomorrow, Washington should start small, with selective adjustment of sanctions rather than their outright cancellation. As Senate Foreign Relations Committee chairman John Kerry said last year, "Sanctions can always be tightened if Syria backtracks" from any deal with American negotiators. Those small steps (like Ford's appointment, for example) are exactly the thing Syria is looking to respond to. Tabler is Next Generation Fellow at the Washington Institute for Near East Policy and author of the forthcoming In the Lion’s Den: Inside America’s Cold War With Asad’s Syria .